Groundwater is an important source of drinking water in rural parts of India. Because of the increasing demand for water, it is essential to identify new sources for the sustainable development of this resource. The potential mapping and exploration of groundwater resources have become a breakthrough in the field of hydrogeological research. In the present paper, a groundwater prospects map is delineated for the assessment of groundwater availability in Kar basin on basaltic terrain, using remote sensing and Geographic Information System (GIS) techniques. Various thematic layers such as geology, slope, soil, geomorphology, drainage density and rainfall are prepared using satellite data, topographic maps and field data. The ranks and weights were assigned to each thematic layer and various categories of those thematic layers using AHP technique respectively. Further, a weighted overlay analysis was performed by reclassifying them in the GIS environment to prepare the groundwater potential map of the study area. The results show that groundwater prospects map classified into three classes low, moderate and high having area 17.12%, 38.26%, 44.62%, respectively. 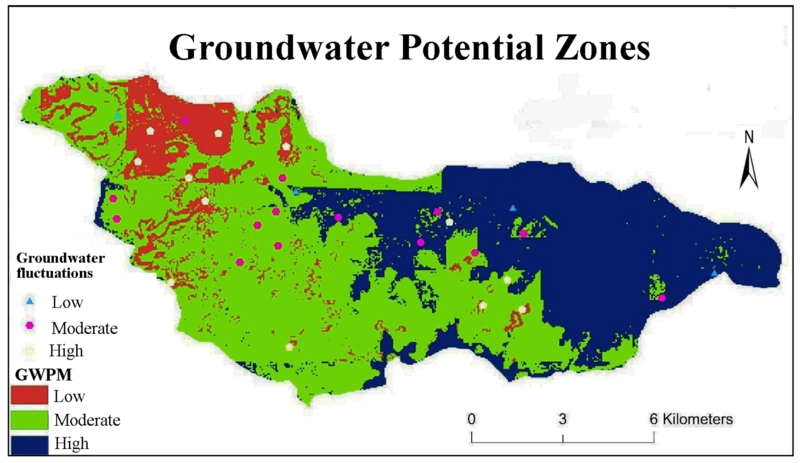 The overlay map with the groundwater potential zones in the study area has been found to be helpful for better planning and managing the resources. Integration of geomorphological and geospatial thematic data was used to delineate groundwater prospects zones. A multicriteria technique, the analytical hierarchical process (AHP) was used for weighted overlay analysis. Results reveal about 44.62% of the total study area to have very high groundwater potential. The methodology can be applied effectively to assess groundwater potential in semi-arid regions.